If you're in Miami and hoping to sneak a peek at the Heat off the court, try Red, The Steakhouse, in South Beach, which has been a favorite eatery for Dwyane Wade and LeBron James. The upscale steakhouse, which opened in 2009 and is an offshoot of the original Red, The Steakhouse, in suburban Cleveland, made it to Miami before LeBron, but James' move to the Heat hasn't hurt. "LeBron was into the Red in Cleveland, but has been to the Miami Red more frequently," said Peter Vauthy, who is executive chef and one of the proprietors of Red. Though the Cleveland location was a go-to spot for James, there haven't been any negative aftershocks because, Vauthy said, the Ohio location isn't near the Cavaliers' arena. Red's shrimp carbonara pasta and chicken is a LeBron favorite. Meat eaters can follow the lead of Wade, who likes the C.A.B. prime steaks, Kobe beef, pastas, seafood and fresh lemonade. "Since we opened, at least 30 different times we've had members of the Heat in Red, along with many current and former NBA players," Vauthy said. Wade has been a regular since the restaurant opened. Chris Paul, Paul Pierce, Rajon Rondo, Hedo Turkoglu, Rudy Gay and Shaquille O'Neal have also sampled the fare. Players can be difficult to spot because they often eat in a VIP section behind drawn curtains. They also usually arrive after normal dinner hours. When Wade walks into the restaurant, "Everyone [gets] a bit starstruck and you could see the guests at the restaurant buzzing about it," Vauthy said. 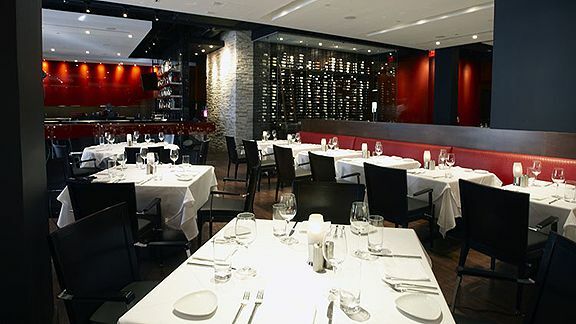 The restaurant, which is owned in part by former NBA player Charles Oakley, is also frequented by NFL and NHL players. As the Heat's season gets into full swing, Vauthy anticipates an uptick. "I'm sure we'll see an upswing due to the buzz and personality of having LeBron as one of our guests," he said.